On Sunday 26 August news agencies around the world broadcast shocking footage of thousands of Nazis rampaging through the streets of Chemnitz in Eastern Germany hunting for “foreigners”. Anti-racists mobilised 1500 that day for a counter-protest, but were outnumbered by the right. The following week much larger anti-racist mobilisations showed the Nazis can be pushed back. The horror scenario was unleashed after the far right took advantage of a fatal dispute. At the end of the Chemnitz City Festival a fight broke out between two groups of people, resulting in one death and two injuries. A police investigation was launched, targeting two suspects: an Iraqi man and a Syrian. The details of the case were then leaked to far right groups, likely by a police or judicial source. “The far right Alternative for Germany (AfD) party and other right wingers immediately suggested that the victim was trying to protect a woman. “The whole far right scene in the state of Saxony, which has a population of over four million, mobilised. “At first the AfD called for a ‘demonstration against violence’ for the Sunday of the bank holiday weekend. The right-wing CFC football club ultras from Kaotic Chemnitz also called their supporters onto the streets. While not everyone who joined the marches was a Nazi, hardened fascists were at the core of it. For example, Martin Kohlmann, a leading figure of “Pro-Chemnitz”, is linked to the “Kamaradschaft” fascist street-fighting groups. 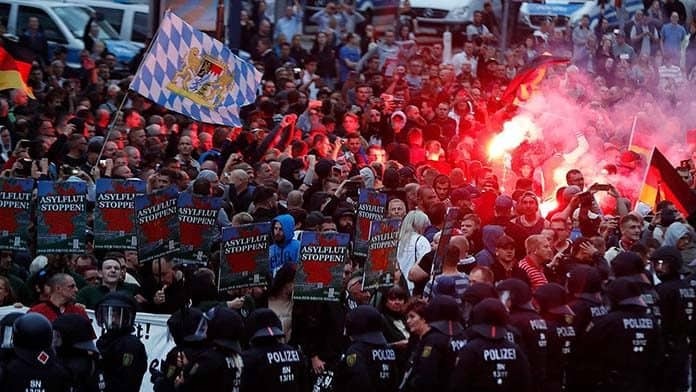 Chemnitz has delivered a warning about the danger of a far right on the rise in Germany. The AfD won 12.5 per cent of the vote in national parliamentary elections last November. This was the first time a far right party had entered the German parliament since 1945. It now has 92 MPs—around half of them are Nazis or linked to Nazi groups. The racism of the mainstream German parties has opened the door to the far right. German Chancellor Angela Merkel promised to listen to the “concerns and anxieties” of AfD voters in the lead up to the election last year. In July she agreed to seal the border and set up prison camps for migrants. Merkel’s Christian Democratic Union (CDU) is the major component of the current ruling coalition, which also includes the Labor-type Social Democratic Party (SPD). As part of this “Grand Coalition” the SPD has helped the CDU push through free market reforms and attacks on working people. This has made it far easier for the AfD to posture as the voice of the marginalised and channel discontent in a racist direction. Anti-fascist and anti-racist mobilisation can beat back the Nazis and the far right. The week after the initial far right protests, the AfD and the Pegida street movement called another racist demonstration. This time the anti-racist counter-demonstration was much larger: “Around 4-5,000 people demonstrated against them. They blocked the route. The Nazis could only walk a quarter of it. “This was a broad counter mobilisation supported by Aufstehen Gegen Rassismus (Stand Against Racism), Die Linke, the Labour-type SPD, the Green Party and others, including refugees, migrants and Muslims,” said Christine.